Jeremy Waters and Aileen Huynh. Photo: Brett Boardman. David Williamson knows all about stage and screen, writers and actors, success and disappointment. 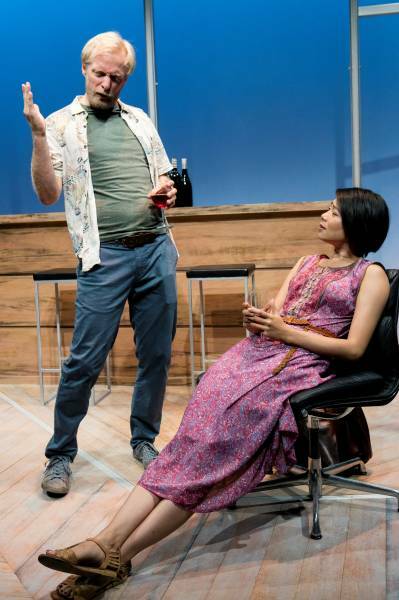 His new play concerns two actors and a writer chasing the elusive big time: a snakes-and-ladders game of shattered dreams, backs for climbing on or stabbing, glints of inspiration and reward, and the remote chance of (whisper it) real money. He was right to think there was play waiting to emerge from the wings of such a world. The problem lies with the female protagonists. Celia (Aileen Huynh) and Vicki (Claudia Barrie) were at NIDA together, when stardom seemed already etched in Celia’s DNA. While she waltzed into fame and wealth via a popular TV soap, Vicki was clawing a living in independent theatre, compensated for her empty pockets by the warm glow of integrity – or integrity laced with a bitchy desire to see Celia’s career plummet, while hers soars to a big time of genuine quality, rather than froth and lather fragmented with ads. Williamson makes the women’s relationship a rivalry (at least in Vicki’s mind) from the outset. Were it established as a genuine friendship that was subsequently shredded by professional rivalry, we’d have had more scope to empathise with both parties in a dilemma that was no one’s fault. As it is Celia becomes like a rag doll left out in the rain, and Vicki the type brazen enough to front the media on Trump’s behalf. Neither actor covers herself in much glory when mired in obviousness and predictability. Jeremy Waters and Ben Wood. Photo: Brett Boardman. This contrasts with the subplot between Jeremy Waters’ Rohan (a long-failing writer and Celia’s boyfriend) and Ben Wood’s Rolly (an old school friend with an idea for a story). 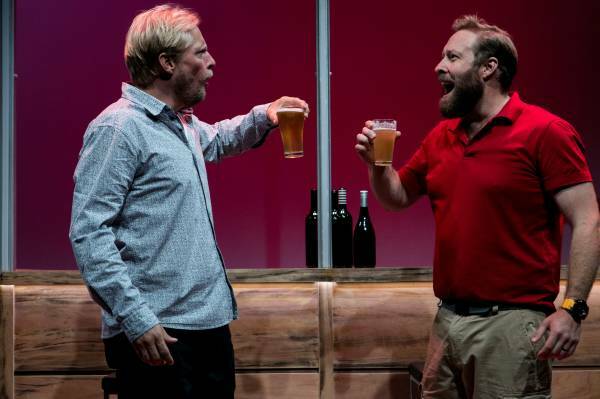 In a play fleshed out with an agent (Zoe Carides) and a producer (Matt Minto), Rolly is the one non-showbiz character, and, in a telling indictment of his own industry, Williamson makes him the sole person we like, laugh at and feel for. From Rolly’s mouth spills all Williamson’s capacity for warmth and wit, allowing Wood to turn in the finest performance in Mark Kilmurry’s fluid production. Rolly also engenders the character growth in Waters’ convincingly embittered Rohan. Of course Williamson may shied from using a similar device twice, but we needed more than bitchiness to make us care if Vicki hit the big time or fell off a cliff.